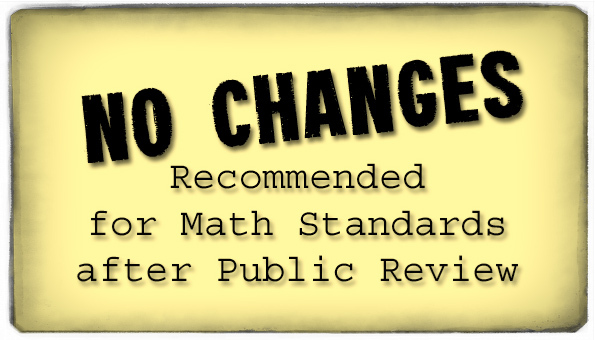 After reviewing the public’s comments submitted during an unprecedented public review of the standards last fall, the state math course of study committee recommended no changes to Alabama’s math standards nor course of study. Only minor changes were recommended for the English Language Arts (ELA) course of study. Dr. Julie Hannah, director of the Office of Student Learning, presented the results of the 13-week public review, “Examine the Standards“, to the State Board of Education at last Thursday’s work session. Math was presented first, ELA second. This is the second time the standards have been reviewed since being implemented in 2012 (Math) and 2013 (ELA). In December 2013, both sets of standards were reviewed by the original course of study (COS) committee and teachers who had been actually teaching the standards, resulting in changes to the standards in January 2014. Steve Ricks, Director of the Alabama Math, Science and Technology Initiative (AMSTI), shared a grid depicting the general nature of the comments made by the public. Comments gathered during the review were sent to the COS members ahead of time, giving the members an opportunity to consider the input prior to the full group meeting in late January. 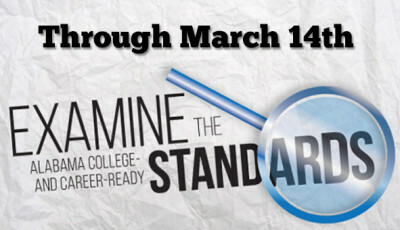 Ricks noted that very few comments were made about the math standards in grades six through 12. Andrea von Herrmann, a teacher from Adamsville Elementary who served on the original COS committee that recommended the adoption of the math standards in 2010, shared the four main concerns seen in the comments about the math standards. 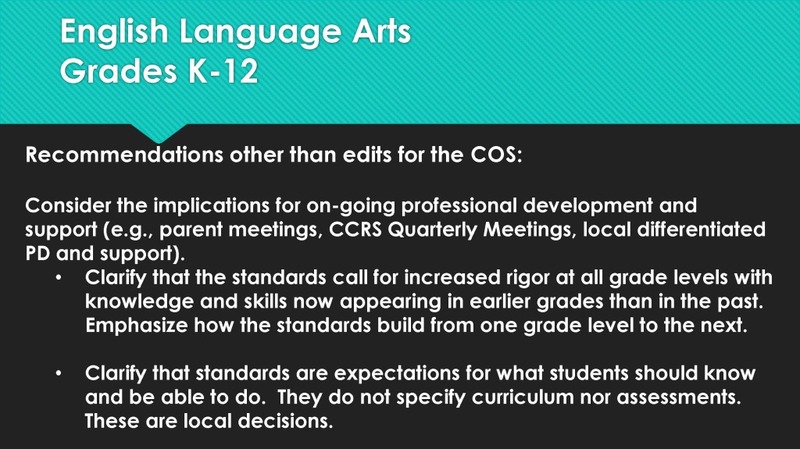 The first general concern was that commenters wanted some standards moved from a lower grade into a higher grade. The next set of concerns had to do with the curriculum being used to teach the standards, which is a completely local decision. Von Herrmann reminded the board that the COS committee has no say in which curriculum is utilized at the local level. The third concern, memorization of facts, “was a huge issue, especially in the younger grades”, according to von Herrmann. “While we agree that memorization is important, it isn’t the only thing,” she added. “We have to teach them the what, the why, and the how.” Von Herrmann said that in her classroom, the algorithm [the actual numerical math problem] is taught as one of a number of strategies. The final concern centered around the examples placed on the web site for review. Von Herrmann said there appeared to be a miscommunication, noting that the examples were only there as one example, not as the example. Many commenters focused on the actual example rather than the standard. As a result of the review, the COS committee recommended no actions were needed, meaning no changes needed to be made to the math standards. Board member Mary Scott Hunter said that most of the comments she gets have do with parents not understanding the new standards and not being able to help their children with homework. Parents tell her that they didn’t learn that math skill in that grade when they were in school. “Especially when [the child is] in the third grade,” remarked board member Ella Bell, garnering laughter in the room. Von Herrmann said that in order to better empower parents, her school, Adamsville Elementary, holds math nights: “We teach [parents] different tools and strategies to add and subtract, multiply and divide”, which is their primary concern. State Superintendent Dr. Tommy Bice acknowledged that learning that the main concerns were centered around implementation and examples, and not necessarily the actual standards, gives them the opportunity to talk with districts about implementation, instruction, model practices about engaging parents. “There’s a lot we learned that has nothing to do with the standards,” Bice said. Hunter added that “parents are a really important piece of this,” and if better efforts can be made to bring them on board, those efforts should be made. Board members Stephanie Bell and Al Thompson questioned the format of the review, citing the cumbersome nature of the review. Thompson questioned how the review was advertised, citing what he called the “low number of comments”. He also said that he was not familiar enough with the actual standards and ended up answering “I don’t know” as a response during his review. Many in the room cited the various avenues through which the review was announced, including social media and through local school districts. Thompson stressed the need to obtain truthful input from teachers, adding that teachers are the group that really need to review these standards. Von Herrmann relayed the experience that when math standards were first being implemented in her district, Jefferson County, teachers often responded with, “Oh my goodness, this is too hard for my students,” but as the standards have been broken down and professional development has given teachers tools to use, the teachers have become more comfortable with the standards. Thompson’s final question was whether the math standard is appropriate for all students, particularly those who are not heading to college and likely won’t even go to a 2-year school. Hannah reminded Thompson that these are minimum standards. “We believe that having these expectations is going to improve life for our kids,” Hannah added, while acknowledging that they must make certain to communicate this so that everyone understands the “why” behind it. Board member Cynthia McCarty asked if further professional development was needed. The answer was yes. Hannah shared that professional development for the math standards is ongoing and continually being improved and expanded. She said that quarterly meetings are held in 11 regions across the state and that every district has an expanded team that attends training. During the first two meetings of the current school year, more than 2700 educators attended. The training meetings are designed so that those in attendance can take the material back to their schools and train others. Hannah added that feedback about the training and development is taken anonymously at the end of each meeting. Last year, feedback indicated that teaching math to special populations was a particular challenge for teachers. As a result of that feedback, the ALSDE has expanded training in that area to better help teachers teach special populations. In addition, the ALSDE has developed five e-learning courses, with five more due to be offered in the near future. This was done to help teachers who are unable to attend the actual training sessions. “My hope is that at the end of this, we won’t be at the bottom of any lists,” Hunter added. 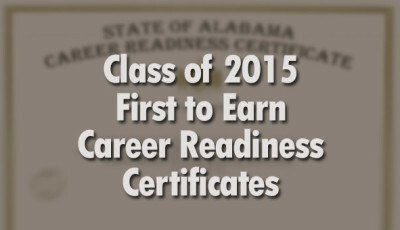 The next several minutes were a look at how Alabama reviews standards and courses of study. 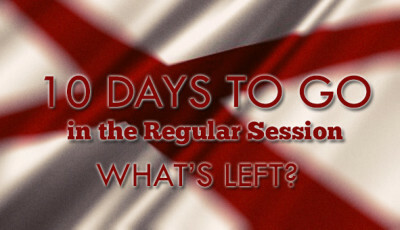 In the past, Alabama only reviewed and adopted new courses of study in a particular subject every seven years, according to Bice. “Now we do it annually,” he added. Here are all of the full courses of study. 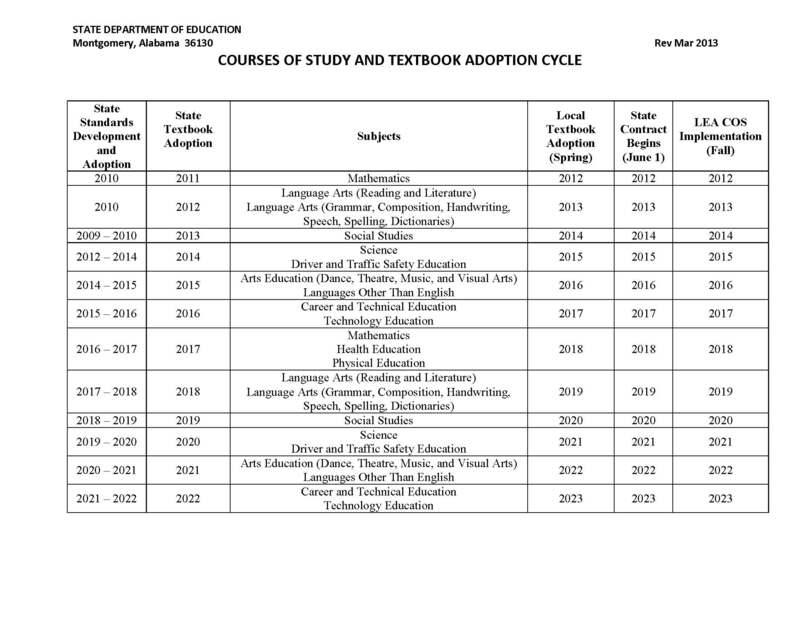 According to this document from the ALSDE web site (depicted below), the full set of standards in a given subject will still be reviewed every six years, meaning that the next full review of math standards and COS will begin during the 2016-2017 school year. NOTE THAT THIS CALENDAR IS DATED MARCH 2013 and is not current, according to the ALSDE spokesperson (see previous paragraph). Lindsey Kissic, a third-grade teacher from Pinecrest Elementary in Sylacauga City Schools, presented the results of the ELA review. 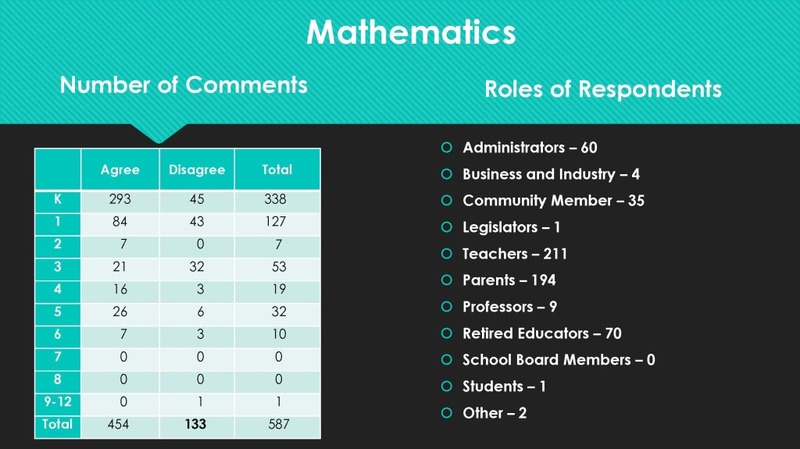 The table showing the number of comments showed the same dropoff in the upper grades that occurred in the math review. However, many more parents participated in this review, in an almost 2-to-1 ration over teachers, whereas more teachers than parents participated in the math review. 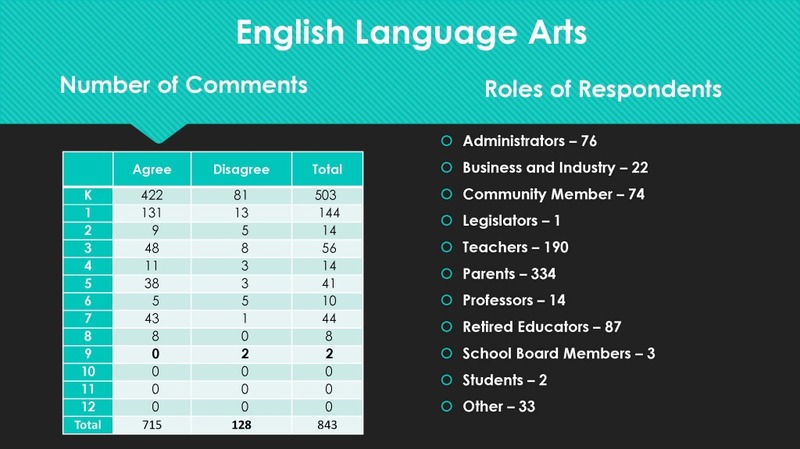 Here is the current ELA COS.
Commenters on the ELA standards had similar concerns to those commenting on the math standards: wanting to move standards to a higher grade level and an uneasiness with local curriculum and assessment choices, which demonstrated a limited understanding of how standards built upon each other from year to year (called “scaffolding”). Here are the recommendations of the ELA COS committee. 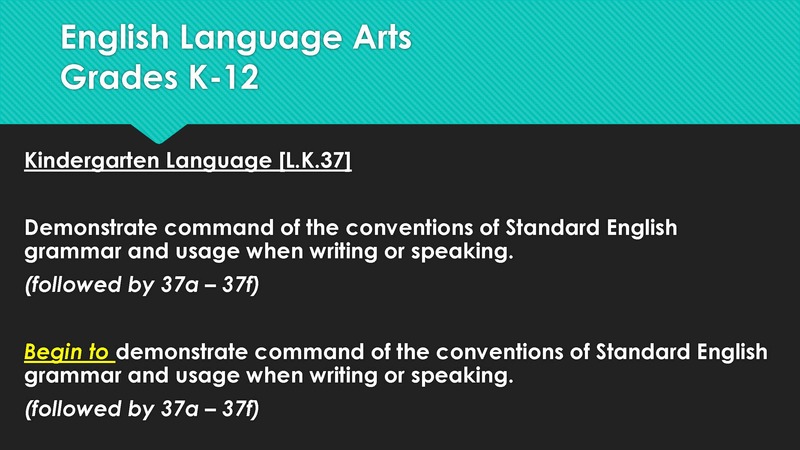 Minor changes to a Kindergarten standard and to a first grade standard. Kissic said that she previously focused on more literature, and that it wasn’t until the shift was required that she made the shift. She said that she is “so glad” that she shifted to informational text, because students learn so much more. Students can read about a social studies or a science topic even though they are in English class. 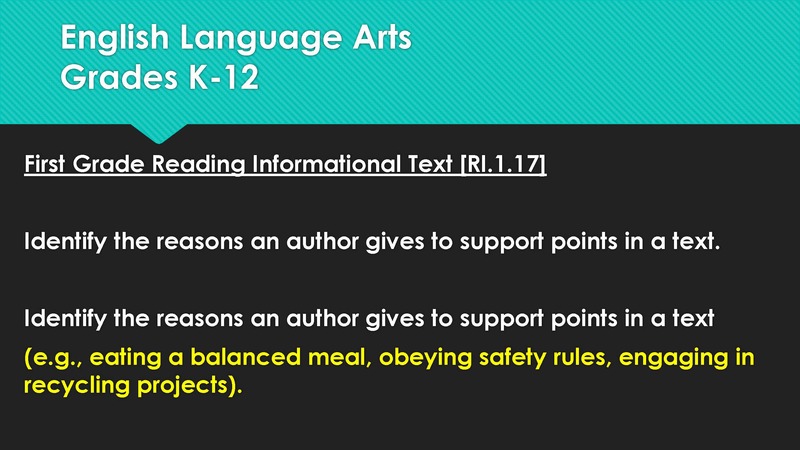 There is such a value in informational text, she leans more towards that now, acknowledging that ELA standards call for a 50/50 split between informational text and literature. There was much less discussion about the ELA standards than the math standards…. Throughout the discussion, Bice reminded all that reviewing standards and implementing courses of study is an ongoing body of work, and that while requesting and receiving input from a large group as was done in the “Examine the Standards” review is important, ultimately the recommendation is the responsibility of the COS committee. Members of the COS committee include teachers, administrators, professors, and other practitioners, and “this is their expert area,” Bice said. Whether the public agrees or disagrees with what the COS committee recommends, that is the structure and the process followed in Alabama. 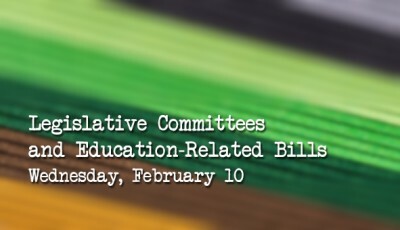 The public had the opportunity to provide input on the standards, though it appears that few (remember there are 735,000 students in public schools across Alabama) actually took advantage of the opportunity. And in the end, the COS committee made few recommendations for changes. Focus groups and “listening sessions” were mentioned as possible ways to gather input for next year’s review. Stay tuned.